88 loyalty points Your cart will total 88 points that can be converted into a voucher of 3,52 PLN. TREC CM3 is a product containing crystal clear Malate Creatine increased dose. It is extremely stable and resistant to the acidic environment of the digestive tract and highly soluble form of creatine. Unlike the simple monohydrate, Tri-Creatine Malate does not have typical side effects and its use leads to more intensive increase in muscle size and strength. CM3 is recommended as an adjuvant to achieve the top condition, especially in the disciplines of strength and speed-strength. Looking for a formulation that effectively improve your training results? If grown in your sports discipline values ​​strength and speed, or you want to build a high-quality hard muscles, then you should reach for CM3. Tried different forms of creatine and not been entirely satisfied with the results? Gain strength and energy was not as high as you expected, or you felt that your muscles retain water? Forget about these problems once and for all! Creatine malate -CM3, and the effects will exceed your expectations. 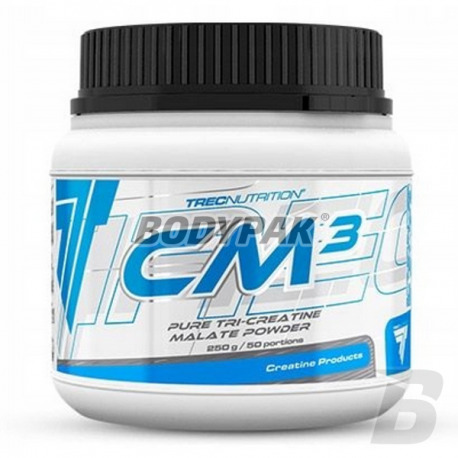 TREC CM3 is an improved creatine formula with exceptionally high anabolic and ergogenic potential. The product contains 100% creatine malate (Tri-Creatine Malate) in a dose of shock. Now it's up to you which form to - powder or capsules in a unique KING SIZE technology. Malate, creatine is produced by advanced production process by combining 3 molecules of creatine monohydrate of 1 malic acid. As a result of this merger creates a form of creatine with unique physicochemical properties. Compared to ordinary monohydrate, creatine malate is more stable, making it more resistant to the acidic environment of the digestive tract. CM3 also does not convert to the ineffective creatinine, as is the case with other creatine. This metabolite side, not only does not cause the increase in muscle mass and strength, but also unnecessary strain on the kidneys. Why CM3 ACT FASTER THAN MONOHYDRATE? Because of its high bioavailability, in CM3 malate quickly absorbed into the bloodstream. Its particles are much more resistant to pH changes in the gastrointestinal tract and thus more creatine is stored in the muscles faster. This is why CM3 helps you achieve vastly improved training intensity at a much lower dose than other forms of creatine. Using creatine malate does not require a loading phase, and no risk of the accumulation of subcutaneous fat and water. TREC CM3 supports the synthesis of the basic fuel cell (ATP), resulting in a dramatic increase in energy levels during heavy exercise. Malate has a much higher potential energotwórczy than other forms of creatine. Interwoven in the chemical structure of malic acid is an important intermediate in the Krebs cycle, wherein as a result of transformation of carboxylic acids produces additional adenosine triphosphate. CM3 has an effect not only on the production of ATP from reduced ADP like other creatine, but it also affects other metabolic pathways. As a result, the total effect of energizing CM3 is so high. Not without significance is the impact of creatine malate on anabolic processes. His regular supplementation results in an increase in the volume of muscle fiber and hydration of muscle cells. In contrast to the simple keratin supplements, the high bioavailability of CM3 is far more effective at stimulating the synthesis of new proteins, even at low doses. That is why the total weight gain at the end of the supplementation cycle is not associated with water retention, but the construction of a hard, high-quality muscles. TREC CM3 is a professional creatine product especially recommended for athletes who want to rapidly improve their exercise potential. The product has an extremely strong energizing effect, allowing you to train longer and harder. 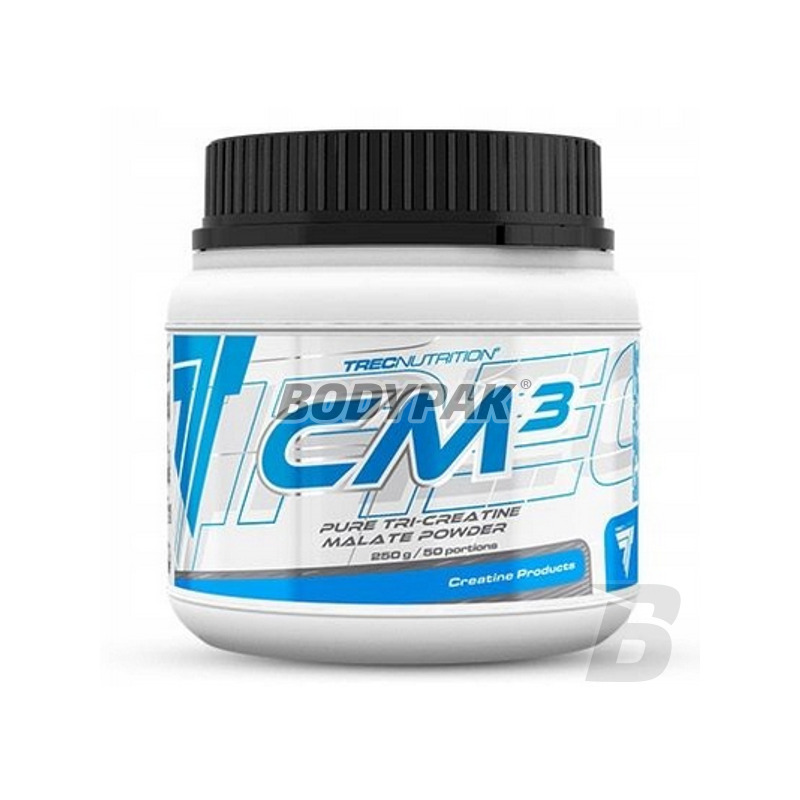 CM3 is excellent for people who have already used once creatine and looking for a more stable and powerful forms. CM3 effectively increases energy production in the muscles and their strength and durability, so it can be used in various sports min. bodybuilding, powerlifting, strongman, or sports and martial arts. 1 serving 20 minutes before serving and after training. serving in the morning on an empty stomach and porcjapo afternoon. Ingredients: creatine malate, anti-caking agent silicon dioxide, sweetener sucralose, flavors, thickeners (cellulose gum, xanthan gum), color for the pineapple - azorubine. Super kreatyna bardzo dobry smak. Nie ma się do czego doczepić! W mojej opinii najlepsza z dostępnych kreatyn. Stosuję ją od wielu lat i mam pewność, że działa tak, jak powinna! Mięśnie są twarde i nie będzie szybkich spadków masy mięśniowej po zakończonym cyklu masowym. Stosowałem rożne rodzaje kreatyny ale jak na razie najlepsze wyniki tylko z CM3. Polecam! Super smaki, dobra rozpuszczalność i przede wszystkim bardzo dobre działanie!